French Comedian Dieudonne Goes On Trial For 'Defending Terrorism' : The Two-Way The charges stem from comments he made on Facebook after the deadly attack on the satirical weekly Charlie Hebdo. The case has sparked debate in France about the limits of free speech in the country. French comedian Dieudonne M'Bala M'Bala arrives for his trial at the courthouse in Paris on Jan. 28. He goes on trial again today on charges of "defending terrorism," following remarks he made on Facebook after the deadly attack on the satirical weekly Charlie Hebdo. Controversial French comedian Dieudonne has gone on trial today on charges of "defending terrorism," which stem from comments he made on Facebook after the deadly attack on the satirical weekly Charlie Hebdo. His alleged crime was writing "Je me sens Charlie Coulibaly" ("I feel like Charlie Coulibaly") on Facebook, an apparent reference to Amedy Coulibaly, the gunman who killed four people at a kosher market in Paris on Jan. 9. Dieudonne's Facebook post was similar to "Je suis Charlie," the message of solidarity that many people shared after the attack on the weekly by Islamist extremists on Jan. 7. The magazine had been targeted for its cartoons depicting the Prophet Muhammad. Dieudonne told the court his comments were not to express support for the attackers. "Of course I condemn the attacks without any restraint and without any ambiguity," he said. If cound guilty, Dieudonne, whose full name is Dieudonne M'bala M'bala, faces up to seven years in prison and a nearly $6,000 fine. Dieudonne has been in trouble before with the authorities. He has been fined for hate speech, and in 2013, the French government tried to shut down his comedy shows, which critics say are anti-Semitic and incite hatred. He rejects those accusations, maintaining that he is anti-Zionist and insisting that his skits target everyone. But Dieudonne's trademark gesture, which is known as a "quenelle," is a straight-arm salute. Critics call it a reverse Nazi salute, but the comedian denies that. The Facebook post for which Dieudonne has been charged has long been deleted, but the comedian also wrote an open letter to France's interior minister, in which he accused Bernard Cazeneuve of "looking for a pretext to forbid me. You consider me like Amedy Coulibaly when I am not any different from Charlie." Dieudonne was also in court last week on separate charges of inciting racial hatred for comments he made in 2013. 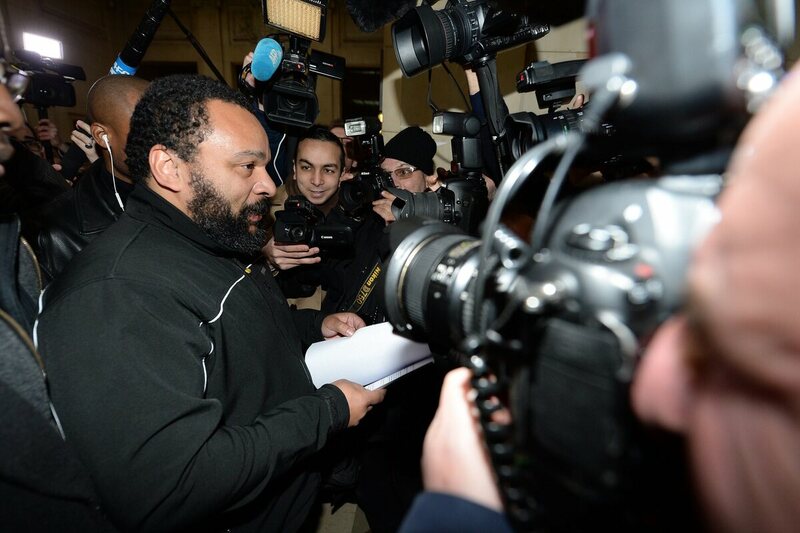 Dieudonne's arrest sparked debate in France about the limits of free speech in the country. Gerard Araud, the French ambassador to the U.S., defended his country's record in an interview last month with NPR. "In France, the speech is free, but [not] if it could lead either to a crime, or if it could be seen as libel. But this is of course under the control of the judge," Araud said. "It's for the judge to decide whether the red lines have been crossed."